There are no comments for Red Drum Two-wooden Living Series. Click here to post the first comment. 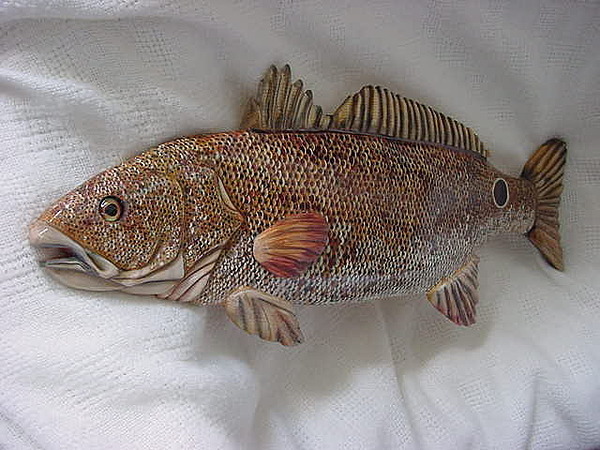 Wooden hand carved fish relief, created without patterns and part of the Living Waters Series of realistic fish. The scales have been drawn on the fish before painting, edges of most scales have been highlighted with a white oil pencil; each scale has been painted in 3 different watercolors, with pearl acrylics added for an iridescent look. The final addition is adding black to the center of the scales since this fish is known for the marking on its scales. Red Drum or commonly referred to as a Red Fish and can live up to 20 years or more. Red Drum #2 measures 24 inches in length, 11 inches wide and has a glass fish eye. Sealed in 7 coats of high grade, high gloss marine varnish that will prevent the colors from fading or damage over time. Has a wire hanger on the back. Comes signed, dated, numbered along with the name by wood burning on the backside. Certificate of Authenticity included.